Ever since spotting a strange, single-passenger pickup with the engine on right side of its cab in Prague, I have been having dreams. Weird ones involving an America filled with the cute trucks it deserves, like the Multicar M22, which amazingly has a payload rating higher than that of a Ford F-250. “The 2020 Chevrolet Silverado HD Wants To Kill,” I wrote a few weeks back about the upcoming heavy duty offering from The General. Like most pickups for sale in the U.S. these days, the new Chevy is going to look angry. Which is a shame, because some of the best work trucks are the cute ones. That green little East German Multicar M22 above, which I took a photo of at the Trabant Museum last week, is a great example. It, along with its siblings the M21, M23, M24, M25, M26, M27 and others, has been doing back-breaking work all across Eastern Europe for many decades, with the Multicar line of work-trucks still around after first showing up in the early 1960s. 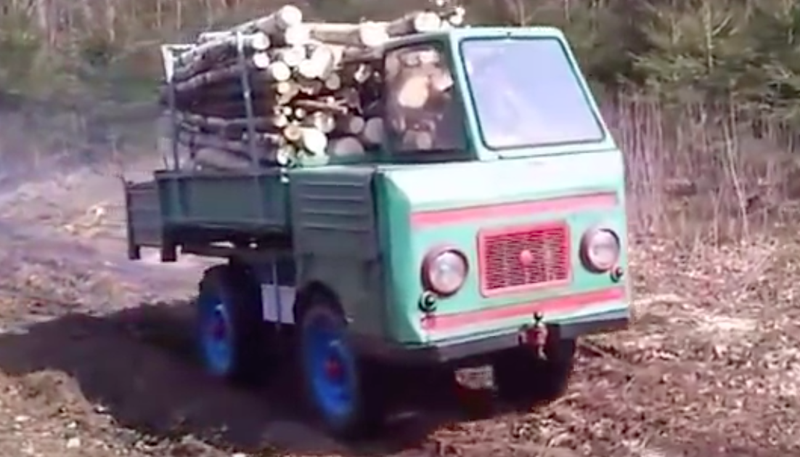 But lest you think this cute little truck is softer than the angry, mean trucks of today, just watch the Multicar carry all that wood in the video above without breaking a sweat. It’s no problem for the M22, which—despite a small 800 cubic-centimeter air-cooled V-twin diesel engine mafking only 13 horsepower (or 15hp, if it’s newer than 1970)—was rated to carry 1,900 kg of payload. Only the single rear-wheel, 4x2, 141.6-inch wheelbase model, with its payload rating of 4,250 pounds, is higher than that of the little Multicar. All other variants of the big, burly F-250 are not rated to carry as much as the cute, single-passenger Multicar. The East German workhorse’s tow rating, or “Anhaengemasse,” is also damn impressive at 2,500 kg, or roughly 5,500 pounds. That’s more than the tow rating of a Ford Explorer. Granted, the comparison is rather silly, as the two aforementioned Ford ratings were determined through specific SAE tests, whereas who knows how VEB Fahrzeugwerk Waltershausen determined payload and tow ratings back in the 1960s. Plus, the little M22, even with a four-speed manual, is only rated to go up about 14 mph. So this is hardly an apples-to-apples comparison. But it’s still amazing to think at just how tough that little Multicar is when it comes to carrying and a towing a load, even with a decidedly un-angry face. Turns out, happy can be tough, too.